LG's curved display is wider than a standard configuration. Boasting of QHD resolution, this display offers a wide work space to view multiple files at once without the bezel distortion caused by a normal dual monitor set-up. Efficiently run several programs and have multiple active windows on the screen at the same time. With the 4-screen split feature, multiple active programs can be divided up effortlessly on a single screen, which automatically re-size to fit available spaces with a simple click or drag. Working with real-time data, research, and writing analysis reports are made easier and more efficient. To keep track of the continuously changing stock market, it is essential to add multiple monitors in the office to be more productive. With standard monitors, taking in all the information causes eye fatigue from thick disrupting bezels. Also, trying to align the data to avoid it from being cut-off is difficult. The 2x3 multi-display setup of the 34UC87M consists of 6 displays that seamlessly connect feeling like a single screen. Analyzation of information can be made all at once allowing for easier trading decisions resulting in profitable opportunities. 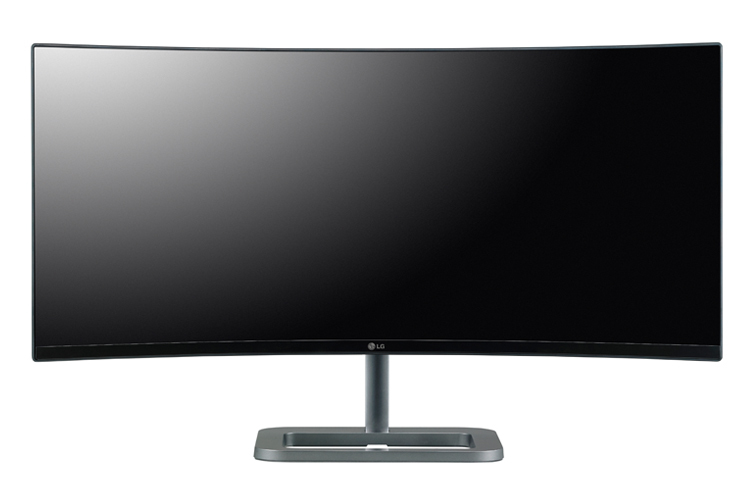 14.6" x 32.7" x 3.1"
LG’s single 21:9 Curved Display is 2.4 times wider than a standard 16:9 configuration. Boasting of 3440x1440 QHD resolution, this display offers a wide work space to view multiple files at once without the bezel distortion caused by a normal dual monitor set-up. Efficiently run several programs and have multiple active windows on the screen at the same time. With a standard 16:9 Full HD display, it is painfully tiresome to adjust each active window continually while you are working on them. With the 4-Screen Split feature, multiple active programs can be divided up effortlessly on a single screen, which automatically re-size to fit available spaces with a simple click or drag. Working with real-time data, research, and writing analysis reports are made easier and more efficient. How to Install & Use the 4-Screen Split Feature 1. Install the 4-screen split software from the CD included in the package. 2. Locate the 4-Screen Split icon  located on the task bar . 3. Select the Screen Split layout desired. A 2x2 Multi-Display setup is a good option for analysts who have to continuously monitor and analyze the global trends and stock markets. With a 2x2 standard 16:9 Full HD setup, the displays are interrupted by a bezel that causes visual distractions and discomfort. With a 2x1 34UC87M Multi-Display configuration, analyzing long charts without interruption from a bezel is possible. It is one of the best solutions for analysts providing a wider working space. To keep track of the continuously changing stock market, it is essential to add multiple monitors in the office to be more productive. With standard 16:9 monitors, taking in all the information causes eye fatigue from thick disrupting bezels. Also, trying to align the data to avoid it from being cut-off is difficult. 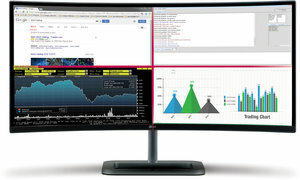 The 2x3 multi-display setup of the 34UC87M consists of 6 displays that seamlessly connect feeling like a single screen. Analyzation of information can be made all at once allowing for easier trading decisions resulting in profitable opportunities.